It is not surprising that the world premiere of Nyaminyami Amaji Abulozi (Nyaminyami and the Evil Eggs) evolved into a critical debate on Zimbabwean cultural identity and the role that cinema will play in how that identity is defined, as the event began with the endorsement of the proposed Artists Charter for Zimbabwe, a comprehensive document outlining the demands of Zimbabwean cultural producers. The lively debate, composed of diverse actors, ranged from the technical specificities of the film, the intentions of the filmmaker, the concerns of the spectators, the film’s portrayal of Zimbabwe as a society, and the broader political, social and cultural contexts. Reactions to the film ranged from strong, strident dislike, to passionate, encouraging approval, which in many ways is indicative of the contrasting experiences and visions of such a diverse Zimbabwean population. Nyaminyami Amaji Abulozi (Nyaminyami and the Evil Eggs) is the second in a trilogy of folktale musicals after Kare Kare Zvako - Mother's Day. A dweller of the deep water of the Zambezi River seduces a starving village. Out of the same water, the great snake goddess Nyaminyami sends her messenger to deliver the village from evil. But not even the magic staff the messenger carries is powerful enough to save the people. For in this world, even the cute eggs are devilish. A biblical story of redemption is narrated in this musical adaptation of ancient Tonga folklore. Tsitsi Dangarembga noted that there are many versions of the Nyaminyami legend, and that this particular account was her point of departure. In response to an audience member’s concern about her choice of subject matter, she emphasised that there are many other stories that could be told and even in the case of Nyaminyami, could be related with a difference emphasis. But whatever the manner that it is told, what is important is that the world knows that this legend is very significant to Zimbabweans. The producer Olaf Koschke evoked a search for a veritable Southern African film aesthetic in the tradition of the legendary films of West Africa, hoping to play a critical role in representing Zimbabwean society. And thus cinema may contribute to the challenge of defining a Zimbabwean film identity, finding a Zimbabwean film language through the Zimbabwean oral tradition. Some audience members did not understand the filmmaker’s intentions and were troubled by what they perceived to be a barbaric portrayal of Africans, that they were presented as cannibals. Tsitsi Dangarembga viewed this response as a direct reaction against stereotypes about Africa in history, thus wanting Africans to be seen as perfect human beings. Similarly, as a feminist she understands that women too are not perfect human beings and that there are also negative aspects about them. Olaf Koschke recalls similar comments about the film Kare Kare, as there were also instances of humans eating humans. Comparing the classic, popular German fairy tale, Hansel and Gretel, where the old witch tries to eat the two little children, he noted that no one objected to this act nor were Germans perceived to be cannibals because of it. Confirming Tsitsi Dangarembga’s assertion, he sees these responses as reactions to stereotypes. In his view, there is a wide range of characters in the film—both good and evil and thus he finds it appropriate to portray both aspects. One viewer stated that he was not moved by the film, that it was not realistic. Tsitsi Dangarembga responds: There are many levels, and what works for one person may not work for another. I do not want to sound like a workwoman blaming her tools. If you are not moved by it, that is fine. We have talked about the constraints and we are trying to push boundaries to say that this is possible. If we all stay within the context of what we see on ZTV without trying to move the boundaries, then no one will say, 'those people have ideas, let's help them develop those ideas.' And this was the context in which Nyaminyami was made. Another viewer appeared frustrated by a perceived lack of technical prowess. Tsitsi Dangarembga responds: Do you have any idea of how much it would take to make a different rendition of Nyaminyami? For somebody who wants to promote Zimbabwe identity, and the diversity and unity of that identity, I could say I do not have the money to do it. So should I not do it? I think this is a good conversation. This conversation should go out so that everyone could hear it. And the ministers could say, 'someone is saying that they were moved by the story but not by certain aspects that could have benefited from a bigger budget.’ If it were not for Poland who said ‘Zimbabwe you have good ideas, let us see what we can do,’ we would not even be having this conversation. I hear what you are saying and the conversation is good, and I thank you for that. An audience member asked about the film production. Tsitsi Dangarembga responds: At the cinematography workshop we had four apprentices who would go with the DOP from Poland in the morning to do theory and work on the storyboard and theoretical aspects. And in the afternoon we would go on location with the directors because there was a director’s workshop at the same time. And this was an idea that I pitched to Shamek, that we need to go this way in our training. So maybe I would like to know why Shamek thought we should go that way. Shamek Stepien responds: The time available to shoot the film was very limited and that so many of the shots were so well done is amazing. Since it was a Polish Aid project we also thought it should have this educational project to make it a more feasible project for Polish foreign aid. Not only were we making the film but we were also assisting in the development of film production. As far back as 1998 we have talked about audience building. The late Ousmane Sembene talked about being able to read a film like being able to read a book. Because our diet of film has been so poor we are lagging behind. I think we do a disservice to ourselves when we say let's make a film that always looks like Farafina or whatever, yes there is room for these kinds of films. But to say that this is the highest level that we as Zimbabweans can go to, this is the only level that we can consume, I think that we are not doing ourselves a favour. I am trying to push boundaries. I am trying to say to Zimbabweans that you are not intellectually deficient film viewers. There are films that you can understand at a higher level. If you really only want to go into a theatre as if you were in a bear hole and go 'ha, ha, ha' all the time then maybe you are missing the point of some of the aspects of film. We need films like that, but we also need people who can enjoy the whole spectrum of film, so I think this is a real healthy debate. For us to say as Zimbabweans we cannot enjoy more intellectual films; I think that is a terrible indictment on us. It means a whole world of films is passing us by (applause). In the audience was Rev. Damasane of the ministry of education who had this to say: The interpretation of the Nyaminyami, I resonate with that, I see Africa coming out of that. If Africa takes more time to understand some of the misunderstood parts of herself, she can find much in her future. The best thing is the meaning that Africa can tap out of a very serious film about herself and a very truthful unravelling of her real self. I do not normally want to give a comment after one watching, but I was attracted by the prophetic role of this film. Tsitsi Dangarembga responds to Rev. Damasane: I can only say thank you very much because that was the idea behind the film. It is an ongoing process, it is a process of education, a process of asking, who are we as Africans? How do we narrate ourselves? Are we going to narrate the truth about ourselves--the negative and the positive, because every culture has the forces of evil and the forces of goodness? So thank you very much for recognizing that. Deputy minister Jessie Majome concluded with a tribute to the appreciative artists, noting that there is an art of appreciating art. In Zimbabwe where there are many diverse peoples, cultures and languages, in her view, the film offered the opportunity to pay attention to cultures different than one’s own. Being able to express diverse views demonstrates that Zimbabweans are beginning to appreciate who they are. Nonetheless, she imagined that during the scheduled screening of the film in Binga, where the Tonga language and mythology is really understood, that communication would be easier, rather than the “bafflement” expressed by many at the Harare premiere. Moreover, she commended the film for its ability to offer a dialogue where feminist issues are also discussed. 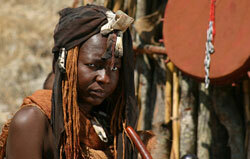 The world premiere of Nyaminyami Amaji Abulozi critically engaged the role of cinema in defining Zimbabwean identity.